But even as the tone of Obama’s overall coverage was better than his opponent’s, much has changed in four years as the candidate of hope and change became an incumbent presiding over a sluggish economy. The media’s coverage of the late stages of Obama’s 2012 campaign was considerably less flattering than it was in 2008 when he was running against Sen. John McCain. 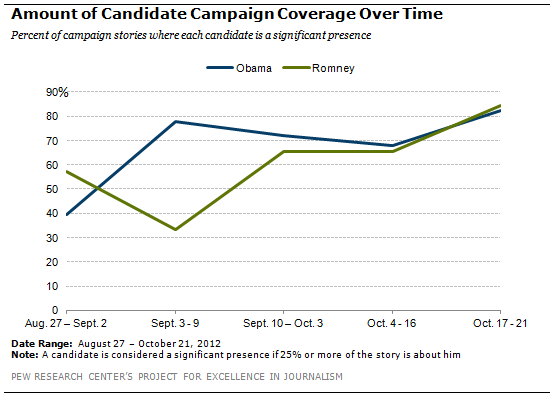 Conversely, Romney has not experienced as much negative coverage as his predecessor did four years ago. The starkest difference is that coverage of Obama is only about half as positive this year (19%) as it was in 2008 (36%). And while his percentage of negative coverage in 2012 (31%) is only modestly larger than four years earlier (29%), neutral coverage has grown markedly, to 50% this year compared with 35% in 2008. The percentage of positive coverage about Romney is very similar to McCain’s four years earlier, but there is about one-third less negative coverage of the former Massachusetts governor’s campaign. Romney has also seen considerably more neutral coverage than McCain received in 2008. In the closing weeks of the 2008 campaign, which played out under the shadow of the Wall Street meltdown, Obama not only received much more favorable horse-race coverage than McCain, the tone of his coverage on policy issues, advertising and fundraising and his public record was far more positive than McCain’s. That markedly more favorable coverage for Obama, nearly across the board on a range of themes, has not occurred in this campaign. Rather, Obama and Romney received similar treatment on the major campaign themes other than the horserace. One other key metric of campaign coverage is the amount of media attention each candidate gets. This year Obama generated moderately more coverage this year than he did in 2008, in part because some of it was focused not on the president as a campaigner, but as the nation’s chief executive. Overall, in the eight weeks studied, Obama was a significant newsmaker in 69% of the campaign stories examined compared with 61% for Romney. In the same period in the 2008 campaign-from September 8-October 16, 2008-Obama and McCain were tied in the competition for exposure, each registering as a major newsmaker in 62% of the stories. For much of that campaign season, Obama had received more coverage than McCain. But once the financial crisis struck in mid-September, McCain took a series of dramatic steps -including suspending his campaign-that thrust him more squarely into the media spotlight. Starting with the week of the Democratic 2012 convention (September 3-9), Obama generated significantly more coverage than Romney in three out of the four weeks in September. Once debate season rolled around in October, that gap closed significantly, with the president maintaining only a narrow edge in coverage over his rival.